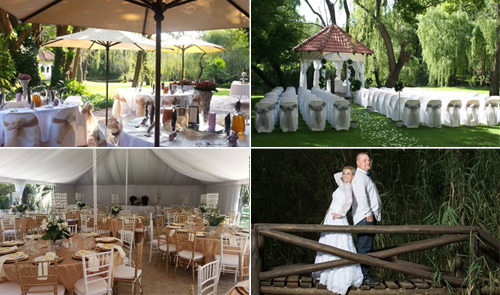 Our Fine Country Estate offers an all in one wedding solution for your special day! Your co-ordinator will pay extra attention to all the finer details that make your wedding the unique celebration it should be. 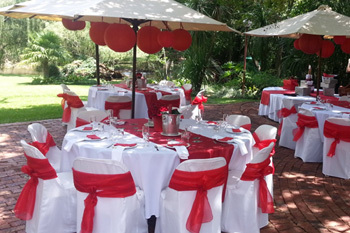 With the Mooi River in the background, our ever popular gazebo lends itself well for ceremonies, however our natural tree canopy is a scenic alternative option for your nuptials. 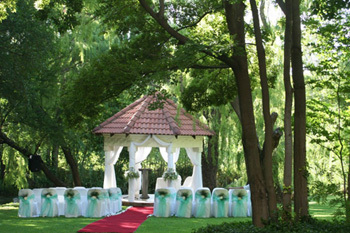 Our beautiful gardens make picture perfect back drops for your photographs. We have a selection of honeymoon suites to choose from and accommodation for your guests, all ensuring a stress free day for you. 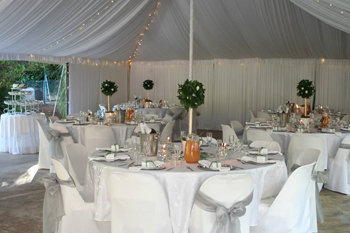 Our magnificent marquee tent can accommodate up to 150 people for a grand wedding reception with all the trimmings. To allow room for a dance floor, we do not recommend more than 120 people. 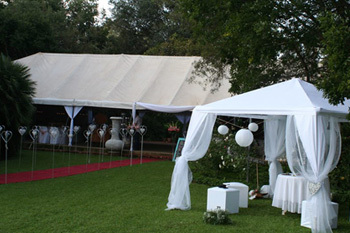 If your guestlist won’t quite fill the space and you have your heart set on this venue, we are able to partition the tent to make the area slightly smaller, for a minimum of 60 people. 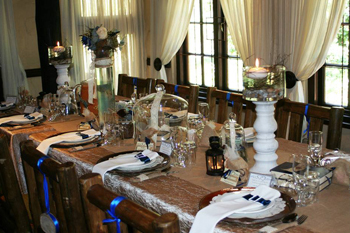 Our venue hire fee includes all the basics; tables, chairs, white linen, cutlery, crockery and glassware...think of it as; we provide the white canvas and you add the colour. Our buffet menus offer the same hearty, home-style cooking that our restaurant is well known for, however, we understand how important the details are for a day like this, and are more than happy to customize our menus to suit your taste and accommodate any special requests. Please see attached packages for more details and contact our office for a customised quotation. This venue is well suited to more intimate groups. We can offer a choice of garden setting on the patio (max 60 people) or inside the restaurant (max 40 people) for a more cosy feel, ideal for winter months. A buffet can still be served here (minimum 20 people) or for smaller groups (less than 20) we can also offer a choice from our a la carte menu. 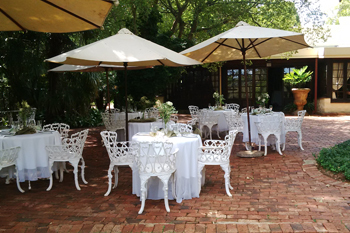 This venue also works well for morning weddings when we serve our delicious breakfast menu. All of our honeymoon suites have something unique about them, just like each of our brides. Subject to availability we can offer an early check in from 11:00 so that you can get ready on the property. This way, there is no rushing around for the bride...but you are still entitled to be late as per tradition! 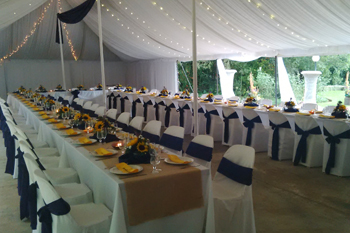 Your bridal party is also welcome to join you here and we can even arrange some snacks and drinks to be served in the room, while the beautifying is underway. All of these rooms offer natural lighting for make-up purposes. Villa 5: Our most luxurious villa has a private garden and patio area where you could enjoy a private breakfast after your big day. 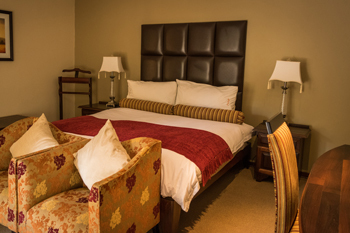 This room offers a king sized bed, and spacious bathroom with a oversized bath & shower. Please click on the link below for more features and images. Garden Room: Located in the main house, this luxury room has a raised queen sized bed with sitting area and en-suite with bath. 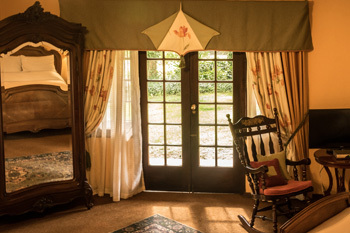 With doors leading directly onto our lucious gardens, the decor reflects a time gone by with prized antique furniture. 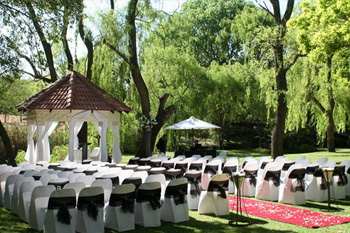 This room offers the best views to keep an eye on your guests as they arrive for your ceremony at our Riverside Gazebo. Please click on the link below for more features and images. 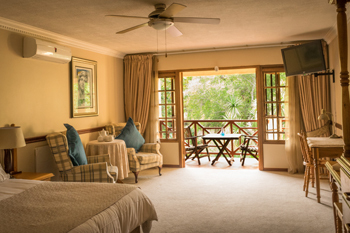 Villa 4: This upstairs luxury villa has a queen sized bed with an en-suite shower over bath combination. There is a sitting area leading onto a private balcony with stunning views of the property where you could enjoy a private breakfast to start your honeymoon off. Please click on the link below for more features and images. 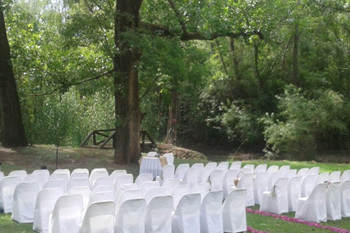 With the Mooi River in the background, our ever popular gazebo it a picture perfect spot to say your “I DO’s”, however our natural tree canopy is a scenic alternative option for your nuptials if you want to feel a little closer to nature. We do allow ceremonies without a reception on our property, however this must take place in the monring and there are a few other T&C’s that apply. View our packages tab for more information.